Tomato and pesto is one of my favorite combinations. I have used it in pasta, appetizer and in quick bread. I thought I’d give this combination a try on a pizza and it was tasty! Even more tasty if you use homemade pesto sauce! It’s so nice to be able to have something quick on the table without putting a lot of kitchen time. That’s my kind of meal on a lazy weekend. Enjoy! Preheat the oven to 350 degrees F. Line a baking sheet with aluminum foil. Arrange the flatbread on the baking sheet and spread the pesto sauce evenly over the top. 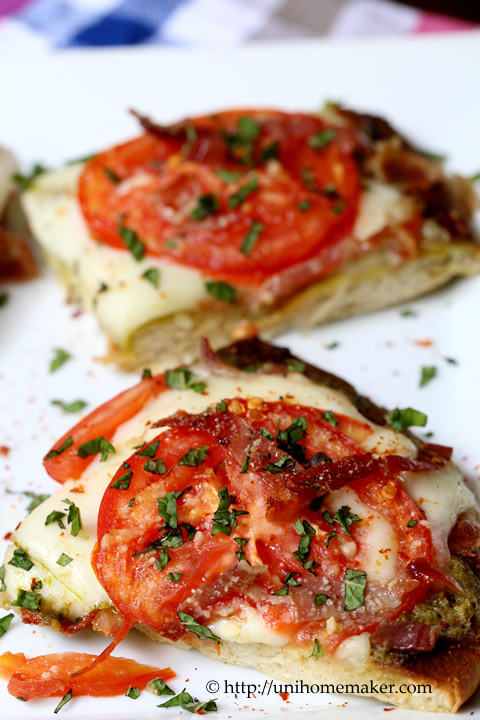 Top the pesto sauce with slices of fresh mozzarella cheese then place sliced tomatoes on top of the cheese. Place prosciutto on top of the tomatoes and then sprinkle grated parmesan cheese over the top. Bake for 6-10 minutes or until the cheese is melted. Turn the oven off and turn the broiler on. Brown the top slightly, about 1-2 minutes. Sprinkle chopped fresh mint leaves on top and red pepper flakes. Cut into 4-6 pieces and serve. In any event – the water should be around 115F – it you put a clean finger in the water, it should seem to be the same temperature as your finger – no hotter & no colder. I’ve found it helps to warm up your liquid measuring cup before you put the water in. Well, there’s my two cents. 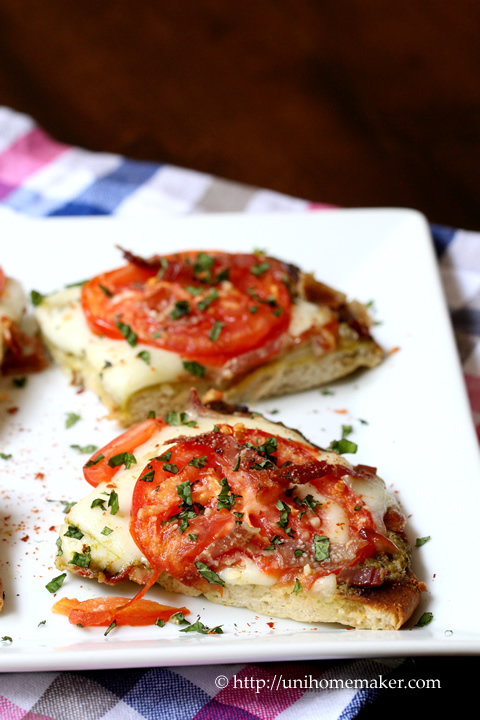 Your flatbread looks so cheesy and delicious, Anne! I love the simple pizzas the best, like margherita, so this one is right up my alley. That cheese looks perfect on those flatbreads! This would be a major dinner hit! Anne, I can so identify with your yeast-a-phobia! Though my occasional yeast successes are minimally increasing, I approach any recipe including yeast and kneading with trepidation! I am going to try Cecile’s (commenter above) finger in the water trick! 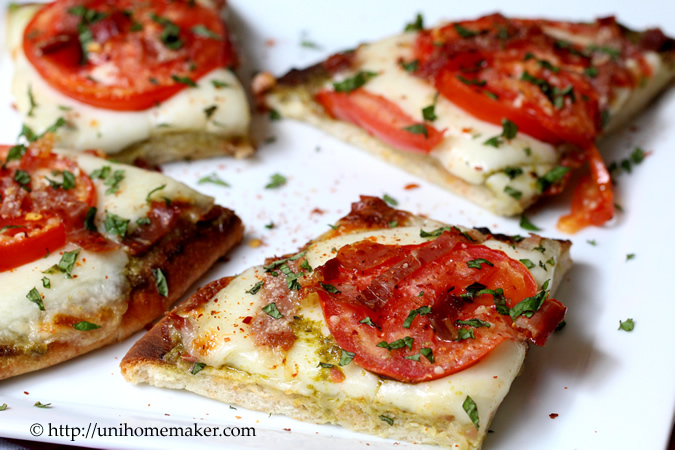 Your flatbread pizzas are a perfect busy weeknight or lazy weekend meal. I always make my pesto because I can’t eat nuts and substitute any nuts with sunflower seeds. Then, I keep a bag of pesto “ice cubes” in the freezer waiting for inspiration like this pizza! I am intrigued by the mint leaves. I’ve never had mint on pizza and will have to give it a try! You even make a quick pizza look delectable! Sometimes simple and quick is best, isn’t it? This looks fantastic! So are those mouthwatering photos! I love pesto–this looks wonderful! Such classic, wonderful flavors here! I could probably eat this every day! If I had to make everything from scratch for our meals, we’d never eat! Taking some store-bought shortcuts is a smart thing and this flatbread pizza looks so good – love the pesto, prosciutto and all the good stuff on it. I can see you enjoying this with a glass of wine (or am I picturing myself doing that… :). Looks delicious! I seriously want this right now and it’s only 9:00 am. It looks amazing. Oh my, I can’t think of anything better than these little treats. Thanks for this post!! Yeast and kneading are intimidating for me too! But it looks like you definitely pulled it off here with flying colors. The crust looks to be the perfect thickness and density. A good bread slathered with pesto is the best. I would eat this for every meal if I could! 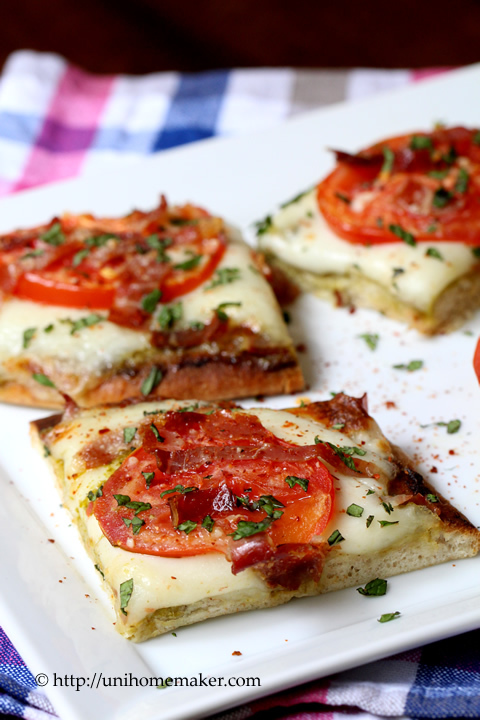 What an awesome combination of cheese, prosciutto and tomato on flatbread! Thanks for sharing! I think i’ve overcome my yeast fear, but anything with yeast just takes too darn LONG! Ugh, who has that kind of time. This flatbread sounds delicious. Premade pizza dough is the way to go! 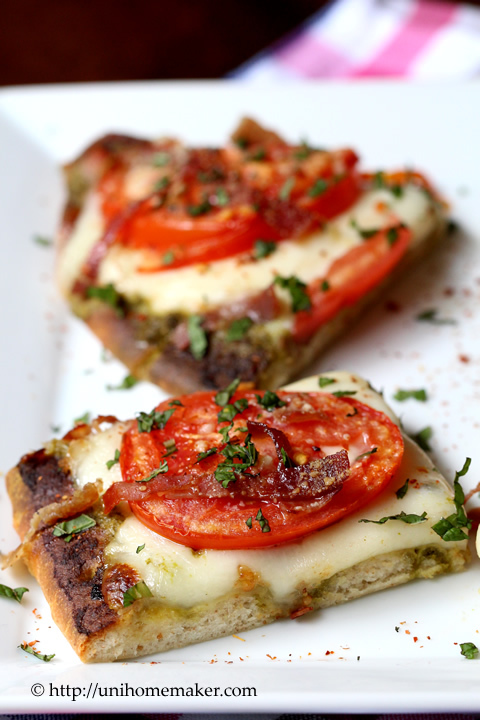 Sometimes you need to take shortcuts in the kitchen- this flatbread looks delicious, I love anything with pesto! A perfect pizza! Using pesto to flavour the base is a great idea. Amazing combination of flavours! Can imagine these taste so delicious… yummy! Can hardly wait to try this! Love pizza! What a perfect weeknight meal! I love a recipe that is quick and easy, but looks like it isn’t 🙂 This recipe looks gorgeous and delicious! I just love pesto + tomato combinations! I love it in pasta, in flabreads, or on pizza like in your recipe. Pure deliciousness! I love meals like this too – even though I love cooking sometimes I just need a break! I still have some homemade pesto leftover from our basil plant that needs to be used up! And I love that you sprinkled the top with mint! I’ve never done that! I love a quick homemade pizza like this — delicious!! Haha, sometimes I’m a moody cook too. And that’s usually when I open a jar of marinara sauce, boil some pasta, and call it a day. Or I order a pizza from the nice pizza shop owners downstairs. But you make homemade flatbread?! I’m impressed! And pesto makes everything better, in my opinion. I think we could all use a good lazy meal every once in a while…and what could be better than pizza! This is so easy and delicious a quick go to meal anytime. Looks fantastic and so flavorful! A great meal for those times when you need something quick and easy! Such a simple dish but looks fantastic! Yummy!!! You have no idea how much I want a piece of this flatbread right now! The tomato slices look fabulous! Just my kind of pizza Anne. Yummy! I agree with you about shortcuts and your flatbread pizza looks delicious. I love tomatoes and pesto together! Even better with mozzarella made into a pizza! Totally delicious! Do you have a bread machine? My Mom makes her pizza dough in there and it comes out really good – it mixes, kneads and then proofs it. Hope you’re having a great week! Oh my, this is definitely something I going to need to make. I love all these flavors – very yummy looking! Pinned!! Oh my, love everything about this flat bread. The flavors, the colors and the look of this flatbread is absolutely gorgeous. I’m eating pizza now 🙂 I love pesto on pizza, and this combination is perfect!